Vantage Career Center will hold its annual Open House and Taste of Vantage event from 5-7:30 p.m. Monday, February 25, to celebrate National Career and Technical Education Month, which runs through February. The open house will highlight both the high school and Ohio Technical Center adult education programs, and is open to the public. “Vantage is opening up the building so our local communities we serve can see and experience how our high school and adult students learn every day,” said Vantage Community Relations Coordinator Miriam Owens. “This is a chance for prospective and current high school students and their parents, community members, business partners, alumni, and interested adult learners to see what opportunities are available to them at Vantage. Vantage high school and OTC Adult Education instructors will be in their career technical labs, while students demonstrate the skills they’ve learned. Career technical education is a strong force that contributes to the support of the local economy. It allows students an opportunity to be career and college ready, graduating with industry certifications and credentials, college credit, and hands-on experience in their field. 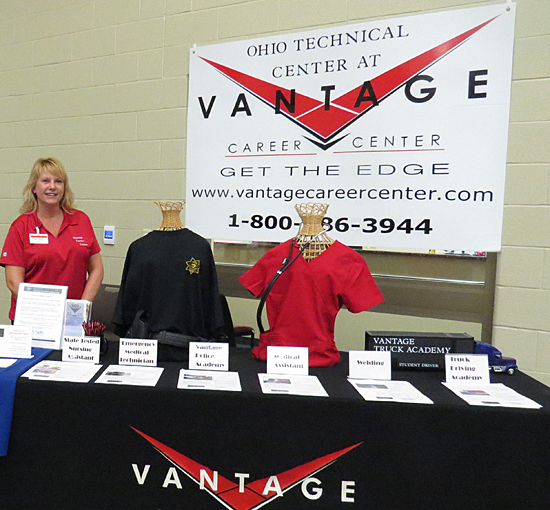 For graduating seniors and adults who are looking to continue their education, the Ohio Technical Center at Vantage provides an opportunity to advance your career path in a short amount of time, for a nominal amount of money. The popular “Taste of Vantage” event, held in conjunction with the open house, features six area restaurants offering a delicious sampling of some of their most talked about cuisine. For just $5 at the door, attendees can purchase a strip of six tickets. One ticket will get purchasers one food sample. All proceeds from the “Taste of Vantage” event support the Vantage schoolwide Student Activity Fund. Enjoy chicken wings from Millie’s Café in Ottoville, taste a pork slider from Gibson’s Barnyard BBQ in Convoy, try a variety of meatballs from Van Wert’s Black Angus on Main, warm up with a cup coffee and sweet cinnamon roll from Brewed Expression in Van Wert, or try award-winning ice cream from The Creamery in Delphos. The Vantage Culinary Arts program will also be serving its fabulous homemadeMexican chips and salsa. Don’t be late, because the food goes fast. In addition to learning more about Vantage and tasting great food, one lucky person could be the winner of a wooden Vantage bench being raffled off. Ticket prices $1 apiece or six tickets for $5. DJ Ron Burt from Magic Moment Entertainment will be the emcee for the evening and will announce the special demonstrations and activities going on throughout the building. Also listen for WERT Radio live interviews with Vantage administrative team members and instructors. To learn more about the Vantage Open House, visit www.vantagecareercenter.comor the Vantage Career Center Facebook page.